The ability to catch in cricket is akin to knowing how to breath, i.e. pretty vital. Dropping catches will not only cost you dearly as a team, and not only mean you might get attacked by the bowler on your way back in to the dressing-room, but also will allow the batsman to score more precious runs. 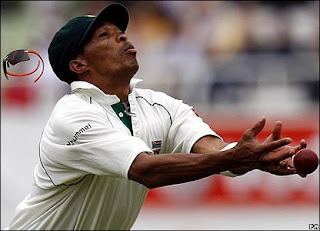 Ntini showed today the true cost of a dropped catch, dropping Pietersen not once, but twice. Ok, so the first catch was quite a tough one, as Ntini was forced to run a fair way to reach the ball (arriving about a second too late and also should have left it to Paul Harris - but that's another matter entirely), but the second chance really should have been taken. Nightwatchgirl is not complaining though, because at the time of writing, England need as many runs as possible. dropping a sitter - an easy catch, also known as a dolly.